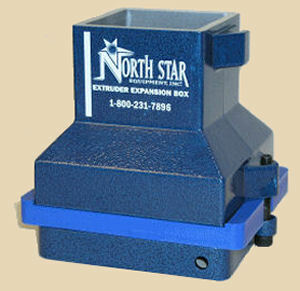 The Northstar extruder has a stainless steel barrel with a powder-coated exterior surface, frame and handle. 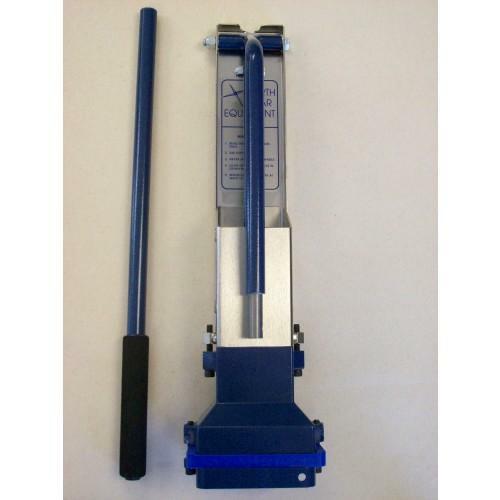 The Stainless Extruder offers versatility and can be used with just about any clay type, as long as the clay is soft and easy to work with your hands. Because stainless steel won't rust, it is ideal for use with stoneware clays and porcelain. If you're going to use these clay types, the Stainless extruder is your best choice. 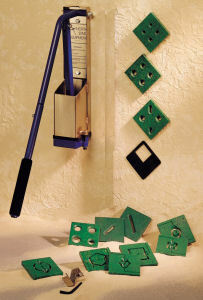 Remember: Stainless extruders come with the NS915 Basic Die Set. Several of the dies contain 4 cavities of different sizes. Use the die mask to block off any three of them. Click the set item number for details listed in 'Dies' section. Not all dies shown in photo are included with this extruder. Click the set item numbers for details listed in 'Dies' section. The Expansion Box is an extruder accessory that allows you to make larger extrusions from your current NorthStar 4" extruder. The kit includes the Expansion Box, die retainer ring and mounting bolts, hex wrench, three piece spacer board and lag bolts, and a sample die (NS9830, the 6" Bread Tray). The Expansion Box is made of high-quality aircraft-grade aluminum alloy. All the mating surfaces aremachined flat for a tight seal. The die retainer ring (and hardware for it) are made of steel. All outside surfaces are powder-coated with NorthStar's distinctive blue for a durable, lasting finish and years of use. Die Expansion Box Package includes die set NS991 and center brace NS983 to fit expansion box. Dies on this page fit NorthStar's Stainless 4" extruders. 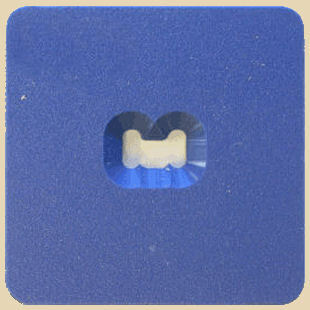 Click here for dies that fit the Expansion Box and Big Blue 6" extruders. In the stainless extruder, every part contacting the clay is either stainless steel or plastic, and will not discolor even the most delicate and whitest of porcelains. NorthStar's Standard dies are made of 1/2"-thick polyethylene, which is extremely wear-resistant and completely non-contaminating. The top edge (facing the clay in the extruder barrel) is beveled to compact the clay as it passes through for a crisper, more solid extrusion. In the hollow dies, there is a bevel on both the interior and exterior portions under each side of the bracket (which holds the hollow dies' center pieces) that helps the extrusion to "heal" after it has been split by the bracket. This bracket fits into a Z-shaped slot machined into the top of the hollow die. The bracket is held in place by the barrel of the extruder. If a hollow die is mounted in place, the center part is automatically in exactly the right place and the wall thickness will be even all the way around. Three of each shape @ 1.5", 2", 2.5"
2 @ 1/2" 2 @ 5/8" 2 @ 3/4" 2 @ 7/8" 2 @ 1" 2 @ 1-1/4"